today, we count down the top 5 tv shows of 2011. but before we get to the positive stuff, let's get the negative stuff out of the way. i never watched '24', but if the showrunners (same as homeland) built the tension half as well as they have in the first season of homeland then i may just have to check it out. i spent every episode waiting (not hoping) for the show to fall on its face. i blame my bad experience with 'the killing' and my general lack of faith in showtime shows. but, by the end of the season, i was finally secure in the knowledge that they had just completed one of the best first seasons in television history. the game of cat and mouse between agent mathison (claire danes) and sergeant brody (damian lewis) occupied most of the season, while the question of will he/won't he occupied the final few episodes. both plot lines were thoroughly engaging and were more than satisfactorily resolved through deft writing and acting. we'll see if they can keep this up in season 2, but at least we can enjoy this past season as a great accomplishment in television. some say it's smug and arrogant. i say those people are morons who lack the requisite taste and knowledge to appreciate this amazing sitcom. since season 1, i've been saying that this show is hit or miss, but that no show is quite this funny or smart when it hits. i know i'm right because critics echo this exact sentiment (i can't help being arrogant when talking about this show). the writers, usually through the character, abed, tackle and play off the mores and motifs found throughout pop culture, in a way that's often insulting, dismissive or condescending, but can sometimes be heartwarming (that's when they are at their best). but regardless, it's always witty and smart. whether the episodes imitate war films, mafia films, documentary films, mock glee, utilize clay-mation or just involve time-travel, the end result is always to add a new layer to the study group's dynamic. and in that vein, the show has succeeded in providing a novel approach to character development, which most sitcoms don't often concern themselves with. best episode: "remedial chaos theory"
it's between 'mad men' and breaking bad for the most critically-acclaimed show of the last several years. bryan cranston, as walter white, has essentially owned the emmy for best lead actor (winning all 3 times he has been eligible). few shows can boast the quality of writing, directing and acting employed on breaking bad. and maybe no show elicits this intense level of reaction and scrutiny from fans and critics, alike. though, at times, i quibble with some of the plot twists and choices, the writers have impeccably constructed, developed and fostered the most colorful and unique characters on television. with 16 episodes left in the show's run, we're all going to be paying close attention to the final act in the story of mr. white aka heisenberg, high school chemistry teacher turned crystal meth impresario. if a tv show was a drug, game of thrones could most aptly be described as crack-meth-oine (i just made that up). 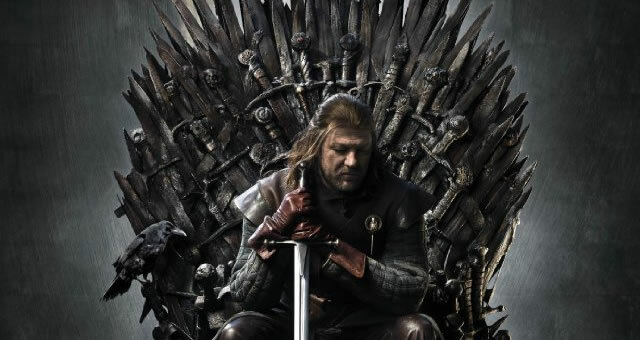 the show is based on the equally addictive series of books, 'a song of ice and fire' by george r.r. martin. after just its first season, game of thrones has successfully created a world so nuanced and fascinating that it's hard to imagine that it's not real (the appearance of dragons probably is a solid hint that it is, in fact, not real). more like 'the wire' or 'rome' than 'lord of the rings', game of thrones is all about power and politics. characters are treated as pieces on a chess board, to be moved, at will, by kings, as pawns try to elevate their status along the way. the usual and absurdly naive concepts of "good" and "evil" are quickly dismissed in this world as characters are never rewarded simply for making the "right" and honorable choice. as queen cersei states, "when you play the game of thrones, you win or you die. there is no middle ground." few shows are this funny. few shows are this heartwarming. few shows employ this level of character development. 'modern family' was once incredibly funny and heartwarming, but never chose to develop their characters in any meaningful way. 'arrested development' was incredibly funny but rarely heartwarming. perhaps not since 'the office' (where creator, michael shur, used to be a writer) has a show been this successful in combining all three aspects. and the office never felt as relevant or poignant as parks and recreation does. in 2011, we were lucky enough to have seen the entire 3rd season of parks n rec (because they didn't start till january 2011) and half of the current 4th season. in that time, characters settled into new and old roles (andy as leslie's new assistant, tom haverford as media mogul, april and andy as husband and wife), adam scott and rob lowe solidified their new roles in the cast after the city went bankrupt (relevant), and all this change served to enhance our appreciation of the interpersonal relationships between the various characters. what we've discovered is that this great ensemble cast, led by the eternally optimistic leslie knope (amy poehler), has built a bond of friendship and support that extends beyond their professional duties. and the writers have successfully developed the characters to this point in a way that feels neither manipulative nor forced. we've come a long way since the premier of the 3rd season where the parks department finally reopened after bankruptcy to the fall season finale where leslie knope's political career is resurrected with the support of the entire parks and recreation department. this show almost makes me want to become a resident of the fictional town of pawnee, indiana. almost. best episode: "ron and tammys"
coming up in 2012, i am incredibly excited for the return of 'mad men' (which i consider the best show currently on tv) in march, the 2nd season of 'game of thrones' in april, and the new hbo drama, 'luck' starting in january, by david milch (deadwood), michael mann (heat) and starring dustin hoffman and nick nolte. hopefully 'community' will return sometime in the spring on nbc and although we have to wait till 2013 (fingers crossed) for 'arrested development', it definitely won't be off my radar anytime soon. finally, the true 2nd season of spartacus (entitled spartacus: vengeance) will begin on starz in january 2012 following the untimely death of andy whitfield from non-hodgkin lymphoma on september 11, 2011. whitfield played spartacus in the first season which aired in early 2010. after starz delayed production for the second season due to whitfield's illness, it later became apparent that he would not be able to continue in the lead role. the show is visceral fun and whitfield was great as spartacus. he will be sorely missed. Jesus H. Tomato you watch a lot of tv. Where do you find the time to still be so awesome? that's why they have 24 hours in a day. in all honesty, i don't want any extra tv. if i'm not watching one of the above shows (and sometimes sports and/or news), the tv is off. plus, half the shows, i watched over the past two weeks while i spent all day in bed. also, my inherent level of awesomeness is so high, i don't need to add much to stay so awesome. LOVE Mad Men....can't wait for the return!! !